Title/Mortgage surveys for real estate closing. All throughout New York City, NY, from Manhattan through to Brooklyn, Queens, Bronx and Staten Island, NY, property transactions are always taking place. Mortgages are normally conditional on obtaining residential land surveys. Completed by a professional land surveyor, residential land surveys confirm property boundaries. Also, a survey also checks to see that neighbors, utility companies or similar have not encroached on the property for any reason. Boundary location surveys for general permitting and property disputes. Boundary location surveys are frequently necessary to confirm the location of property lines on architectural projects. Identifying the location of property lines is crucial and requires serious consideration of subdivisions of land, design and development of improvements near boundary lines. FEMA Elevation certificates for flood insurance. Nobody wants to be the victim of a flood, especially when they do not have the right insurance in place. 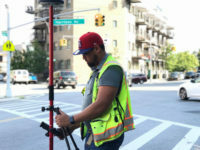 We can complete the residential land surveys needed throughout New York City, NY and the surrounding area to check elevation and provide an accurate assessment of flood risk. Whether you are purchasing in the Bronx, Staten Island, Queens or Brooklyn, NY, we can complete your flood assessment quickly, competently and for a very competitive price. A survey that marks the boundaries of your property for verification of your legal property description found in your DEED, placement of improvements near the boundary, or to resolve property disputes with neighbors. This type of survey describes the topography of your land to locate the physical features that exist on site, including natural features such as trees and streams, and man-made features like buildings, roads, manholes, etc. The resulting plans will include all these details, as well as vertical information (terrain elevation) with the relative heights of the ground and other identified features. This survey verifies that your residential/commercial construction or improvements comply with your plans and with local regulations, helping you obtain a Certificate of Occupancy (CO). A survey used to split or merge your existing parcel(s) of land. The decree and consequences for splitting lots can be vastly different depending on the governing jurisdiction of the municipality, and it’s important that the surveyor know these rules, so that proceeding plans will be accepted. At Rampa Surveying, we are thoroughly knowledgeable in the requirements of local zoning authorities, and we know how to draw your plans to their specifications.